William Branham taught that in some of the prior "church ages", a true Christian was required to believe a doctrine of the devil (the Trinity) to be saved. If they rejected the message that the messenger brought (which included the doctrine of the Trinity), they were lost. 1) William Branham taught that each church age had its own messenger to that age. 2) He also taught that in order to be saved, you have to believe the messenger’s message for that age. 3) At least several of the "church age messengers" believed and taught the classical doctrine of the Trinity. 4) William Branham clearly taught that the doctrine of the Trinity was Satanic. Message believers have to accept this because he said it was “Thus saith the Lord”. And you'll see in a few minutes; I want to get to it, let the Bible just speak what it was. It was the seven ministers, one minister to each age of these Seven Church Ages, come out, hold them in His right hand. Amen. There He is. There was seven angels, seven messengers, one to each church. Get it? An angel for each church age... They had the same ministry, exactly the same all down through the age in that little church. Sardis. And the messenger to this church age was Martin Luther, becomes more familiar to the Bible scholar or this teacher, or the laity, rather, today. And that church age began in 1520 and ended in 1750, 1520 to 1750; and the age of what we call "Reformation Age." The angel of the church of Philadelphia was John Wesley, the messenger. That's exactly what took place in the days of Noah; that's what took place in the days of Lot; that's what took place in the other days, the days of Moses; that's what taken place in the days of Jesus Christ. For they despised the message and perished, and those who believed the message was lost... or was saved. Now, now, then comes the church dispensation in. We lived back in Noah's time, the antediluvian; we come into the dispensation of law; then in the dispensation of grace, the church. And now the church dispensation is ending. We all know that. Now, if God did thus-and-thus in that dispensation, in those other two dispensations, He has to remain the same and do the same in this dispensation, 'cause He said He would do it. I'll prove it in a few minutes, by the Word, that He said He would do it. Now, He cannot change His program, He's God. Notice what He did in them dispensations. He did in that age just as He did in all ages, and like He will do, just as He promised to do. God promises anything, then He comes down and proves His Word to be right. All that believe, all that believe the Message of that age, come in and was saved. So will it be in any age. All who did not believe the Message and the messenger, perished. And the prophets, or the Holy Spirit speaking through Paul, which was the Messiah. Wasn't Paul, it was Christ! "God, in sundry times and divers manners spoke to the fathers through the prophets, in this last day by Jesus Christ," Hebrews 1, notice, the Holy Spirit, Christ, Christ-centered Gospel, Christ-centered Word. And if It is Christ-centered, and been vindi-… God will vindicate It to be the Truth. 145 That's the reason you Pentecostal people receive the Holy Ghost in the faith of the Method-… face of the Methodist sanctification, because you was exactly on the Word. That's the reason you Methodist got sanctified when the Lutherans didn't believe in it, you were on the Word. That's how you Lutherans got saved, justified, because your messenger preached justification, and protested the Catholic church which was an off brand of all. They just believed in the church; you come back to the Bible, and you took that Bible truth and held to it. And then along come Wesley with another truth, and held to it; along come the Pentecost with another truth, and held to it; then if you can hold to that and see it's right, why not take the whole thing that's been proved right? Believe it all! In his sermon ‘On the Trinity’, Wesley is clear where he stands. The Trinity, he says, ‘enters into the very heart of Christianity: It lies at the heart of all vital religion’. It must be emphasized that Wesley grounds his soteriology in the Trinitarian being of God, in the God-man Jesus Christ and the universal sufficiency and scope of his objective work of redemption, and in the all-enabling power of the Holy Spirit, who comes as prevenient, convicting, converting, and transforming grace. Now, my precious brother, I know this is a tape also. Now, don't get excited. Let me say this with godly love. The hour has approached where I can't hold still on these things no more: too close to the coming. See? "Trinitarianism is of the devil." I say that THUS SAITH THE LORD. I said, "Then you have to refuse Jesus Christ, for He is the revelation of God, God revealed in human flesh." Unless you see it, you're lost. Jesus said, "Except you believe that I am He, you will die in your sins." He is the revelation of God, the Spirit of God revealed in human form. If you can't believe that, you're lost. You put Him a third person, second person, or any other person besides God, you're lost. The polytheistic religion of the enemy began with the trinitarian doctrine. It was way back there in antiquity that the "one God in three persons" idea came into existence. How strange that our modern theologians have not spotted this; but evidently just as duped by Satan as their forebears were, they still believe in three persons in the Godhead. Let us be shown just one place in Scripture where there is any authority for that doctrine. Is it not strange that while the descendants of Ham went on their way in Satanic worship which involved a basic concept of three gods that there is not one trace of the descendants of Shem believing such a thing or having any ceremonial worship that involved even a type of it? It is not strange that the Hebrews believed, "Hear, O Israel, the Lord thy God is ONE God", if there were three persons in the Godhead? Abraham, the descendant of Shem, in Genesis 18 saw only ONE God with two angels. 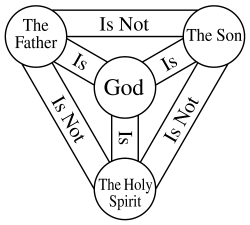 Now that is what modern theologians try to tell us when they talk about a trinity. Just remember this one thing from now on: these records are facts and this is a fact--Satan is a liar and the father of lies, and whenever he comes with any light it is still a lie. He is a murderer. And his doctrine of the trinity has destroyed the multitudes and will destroy until Jesus comes. For example, right now unless the local ministerial association approves in many, if not most cities, one cannot rent a building for religious services. To become chaplains in the armed services, hospitals, etc., it is now almost mandatory to be recognized as acceptable to the trinitarian ecumenical groups. As this pressure increases, and it will, it will be harder to resist, for to resist is to lose privilege. And so many will be tempted to go along, for they will feel it is better to serve God publicly in the framework of this organization than not to serve God at all publicly. But they err. To believe the devil's lie is to serve Satan, even though you may want to call him Jehovah. But the elect will not be deceived. ↑ Hans Hübner and Bruce D. Marshall, “Justification,” The Encyclopedia of Christianity (Grand Rapids, MI; Leiden, Netherlands: Wm. B. Eerdmans; Brill, 1999–2003), 95–96. ↑ Philip Schaff and David Schley Schaff, History of the Christian Church, vol. 8 (New York: Charles Scribner’s Sons, 1910), 706. ↑ Douglas F. Kelly, Systematic Theology: Grounded in Holy Scripture and Understood in the Light of the Church, vol. 1 (Ross-shire, Scotland: Mentor, 2008), 507. ↑ Kenneth Wilson, Methodist Theology, Doing Theology (New York; London: T&T Clark, 2011), 64–65. ↑ Geoffrey Wainwright, “Methodism,” The Encyclopedia of Christianity (Grand Rapids, MI; Leiden, Netherlands: Wm. B. Eerdmans; Brill, 1999–2003), 508. This page was last edited on 2 September 2017, at 16:56.